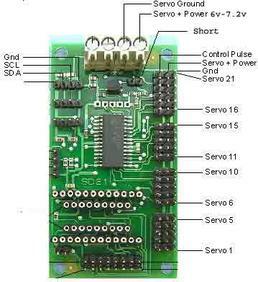 The Devantech SD21 is a servo controller for driving up to 21 servos via I2C address 0xC2. If you are only using a single battery for the servos and to power board then connect the battery to the servo supply terminals as shown and make sure the 2 pin jumper header is shorted together. Alternatively you can power the board logic from a regulated 5V supply and provide a separate unregulated supply for powering the servo only. In this case the jumper should be left open. 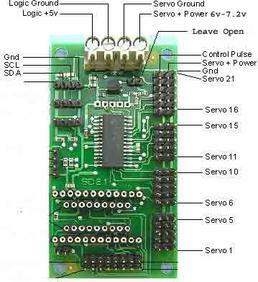 // Define two servos on the SD21 card.